The Gartley Pattern offers early warning of potentially significant reversals in price trends. Like all Harmonic patterns, it is formed by a series of specific Fibonacci reversals of price moves. It is thought to be successful about 70% of the time — much better than house odds. Combined with sound trade management technique, it can provide significant returns with limited risk. It’s a rare week that I can’t find a decent looking Gartley Pattern set up. On November 7, 2011, I saw one forming on SPX and posted about it here. 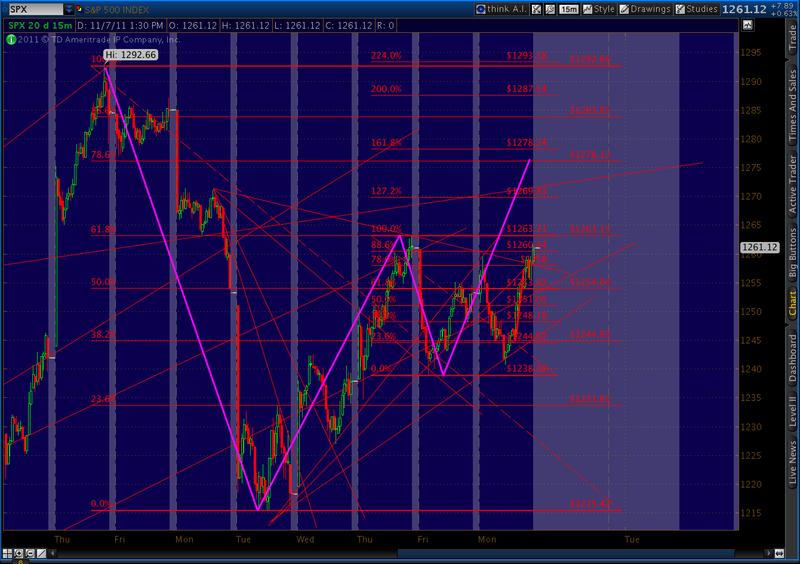 With SPX at 1261, the Gartley indicated prices would rise to 1276.13 and reverse. 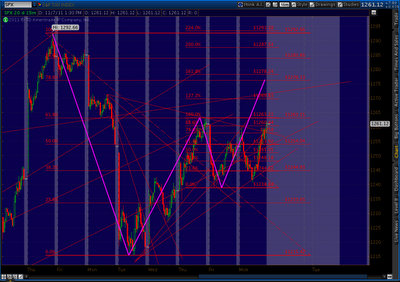 Here’s the chart I posted that afternoon; the purple line shows the forecast move. The following morning, SPX opened at 1261.12, raced up to 1277.55 and closed at 1275.92. The next day saw a 50-point reversal. Each $1 invested in at-the-money SPY puts on the afternoon of the 8th was worth $3 the next day on the 9th. Pretty cool, huh? 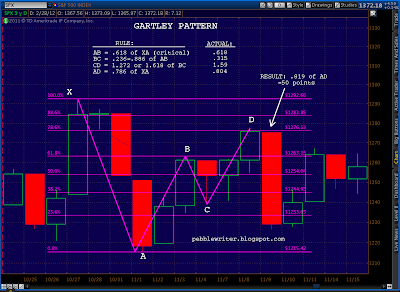 Let’s take a look at how Gartley Patterns work, using the actual prices from October 27 – November 9, 2011. I’ll use the daily chart from that period to illustrate. A Gartley begins with a significant directional move. The origin is labelled X, and the terminus is labelled A. The size and timing of the original move isn’t crucial; I’ve played some Gartley’s that spanned years and others that spanned an hour. The reversal at Point A establishes the low of the pattern and our first leg, known as XA. Next comes a move back towards the origin price — aka a retracement. In a Gartley Pattern, a retracement always occurs at the Fibonacci 61.8% of the XA leg — meaning simply that we have recovered 61.8% of the initial price drop. Note, Point B can be off a little, but a very big miss means it’s probably going to be some other kind of pattern — or none at all. Here, our Point B came in very, very close to the .618 level: 1263.21 versus the ideal 1263.15. At this point, we start to wonder if we have a potential Gartley on our hands. The ideal BC leg will typically range from 23.6 to 88.6% of the AB leg — although this is the least critical measurement of the entire pattern. I’ve seen Gartley’s successfully play out with tiny little BC legs, and others that retraced almost the entire AB leg. Here, we saw a 31.5% retracement. It’s not a Fibonacci number but, again, it’s just not that important as long as it looks like a significant reversal. The next phase of the pattern — the CD leg — is the most thrilling. We know, as we pass our previous Point B at the 61.8% level, that the 78.6% level waits up above. Knowing a reversal is coming, especially when everyone else is getting more and more bullish, is both scary and exciting. In this case, the ideal Point D was 1276.13. Again, this represents a 78.6% retracement of the initial price drop from X to A. We surpassed it just a little, hitting 1277.55. A little overrun isn’t unusual, especially — as happened here after a 16-point gain — the market has a head of steam on it. The next phase is the fun part. After reaching Point D, a typical Harmonic Pattern reversal is 61.8% of the AD distance. In this case, that would have been a 39-point drop. Instead, we had a 81.9% drop the next day for a whopping 50-points (3.9%). At times, reversals can go beyond Point A for a 1.272, 1.618, etc. extension of the AD distance. In fact, over the following 11 sessions, SPX fell an additional 64 points for a nearly 200% extension — a remarkable 5:1 return for those at-the-money puts. As mentioned earlier, Gartley’s don’t always work. So, it’s prudent to plan your trades carefully. Many traders, for instance, will jump in just before a target is hit and place a stop just on the other side of their target. I have several rules that I typically follow to limit my risk when putting on such a trade. I also look for corroboration from other chart pattern and technical analysis.